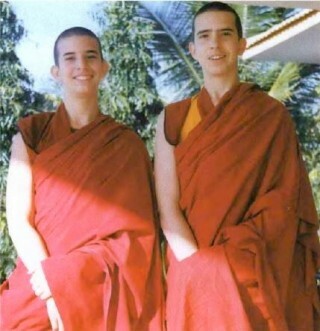 Kunkyen, left, with his brother Lama Osel. Photo by Paco Hita. Our Tibetan brothers and sisters meet the Dharma as mere babes in a monastery. Does this give them an edge over young Westerners who are part of an ever-growing spiritual subculture? Or is it simply a different approach to the same goal: enlightenment? Julia Hengst meets up with some young lama reincarnates. But first, she gets the inside scoop from a young Spanish boy, Ven. Kunkyen. Ven. Thubten Kunkyen, 14, is the brother of sixteen-year-old Lama Osel Rinpoche, Lama Thubten Yeshe’s reincarnation. He was ordained at age six. He talks about his life at Sera Je Monastery in South India, where he lives and studies alongside his brother. Why did you choose to be a monk? I came to Sera on holiday once, and liked how the monks’ studies were conducted. When I asked Lama Zopa if I could be a monk, he asked why. The only thing that came out of my mouth was, “To stop anger.” I guess he liked that answer! Out of nine children in my family, Lama and I are the only monks. Do you like monastic life? Yes – sometimes it’s strict, but it’s okay. We are always studying; mostly debate and memorization, and the regular studies kids do in Spain. Debate is my favorite; it makes your mind so sharp, and you can get anywhere with debate. My least favorite thing at Sera is the discipline! Every time you want to leave Sera you need a signed and stamped pass. Do you feel different from other fourteen-year-olds? The root of your life’s problems becomes non-existent when you cherish others.